After locking through to exit the Dismal Swamp, we passed through Hampton Roads, which never ceases to impress us - talk about feeling dwarfed. In two days we made it to Solomons, MD, where we stayed long to get haircuts, pick up a few groceries and have dinner at CD Cafe. (In case you're boating to the area and planning to use the laundromat there - it's gone.) Solomons can really feel like a step back in time - this boat "Honey" cruising by reinforced that image. 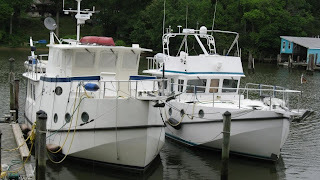 We left Solomons to beat some weather and stopped at Bruce and Joan's in Annapolis. We really enjoy our visits with them. It's always interesting to hear about Bruce's latest projects - and his collection of data about the boat is incredible! They also do way too much for us while we're there. 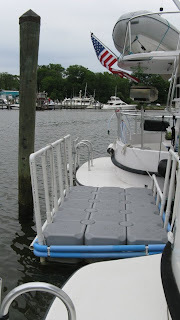 Bruce has even constructed a float to make it easy for visiting boaters to get to the dock. Thanks again, guys! Joe was waiting on some mail (boat supplies) so we stayed longer than anticipated, but quickly made up for it. After splitting the trip to Cape May into two days, Joe was ready to get serious. He decided we'd go offshore all the way to Sandy Hook, NJ. 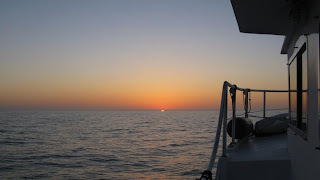 To do this, we left just before sunrise - 0 dark early - and saw the sun rise as we started out into the ocean. 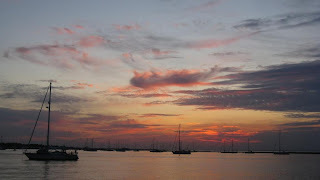 Thanks to wind/waves that boosted us to 10 kts on occasion, we anchored just before sunset at Atlantic Highlands, NJ. It was a long day, but it was nice to skip the NJ ICW. 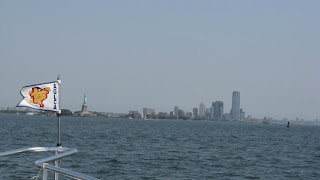 The next day, we made the short trip back to our old anchorage behind the Statue of Liberty. The burgee (flag) on the boat is for the American Great Loop Cruisers Association and has an illustration of the Great Loop route on it. Once we complete the Loop, we'll be able to get one with a gold background and white map and receive our "Baccaloopreate" degree. 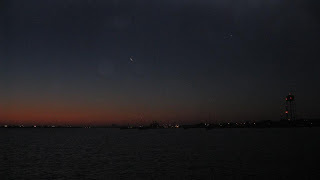 Although a short trip, it was not uneventful. While both of us were trying to keep track of all the boat traffic, Joe suddenly slowed to idle speed and walked to the back of the boat. There was the Coast Guard, blue light flashing, waiting to board Carolyn Ann. 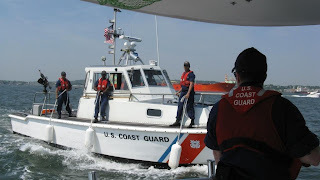 The two reservists who came aboard were pleasant; checked a few things and chatted briefly with Joe once the law enforcement connection was made. One is NYPD and the other is Customs, which trains at FLETC where Joe used to work. Our trip up the Hudson unfortunately started out with light fog. The Manhattan buildings were as impressive as last year, but the pictures aren't great! Although we've never actually considered living in the city, DirectTV now has this location as our service address. Because of some odd - discriminatory - rules, we have trouble receiving network programming. This NY address is supposed to help us out - we'll see. As we approached the George Washington Bridge (once the longest suspension bridge in the world), we started looking for the little red lighthouse. It looks very small next to the bridge, but was originally a light at Sandy Hook, NJ. This was the inspiration for the book "The Little Red Lighthouse and the Great Gray Bridge." One of the things that started us thinking about getting a boat and taking this trip was a PBS show on cruising the nation's rivers. I don't remember it specifically, but I'm sure it was scenery like this - the Palisades in NJ - that sparked our interest. Pictures just can't do it justice. Once under the Tappan Zee Bridge, we stopped at the Tarrytown Marina for a couple days of land based sight seeing. When we were at Bruce and Joan's, Joan asked me what all we were planning to see on this trip. It was then that I realized that aside from the scenery along the river, we really hadn't made any plans. Thank goodness for the internet and those that have gone before us! After getting situated at the marina, we called a cab and took off for Lyndhurst Castle. It was the summer home of several people, the most notable being railroad magnate Jay Gould. We enjoyed our tour of the mansion - no pictures inside allowed. Basically, we're doing what we like best - looking at real estate. A whole 'nother level of real estate! Yesterday we went to Kykuit, the Rockefeller estate. This tour included one floor of the mansion, some of the gardens, some of the art galleries in the basement, and the carriage house. Again no photos inside, but we enjoyed the outside just as much. The amount of art - paintings, tapestries, sculptures, etc. - inside and out is just astounding. If you are in this area, take this tour. We lucked into the blooming rhododendrons and a gorgeous day. The property has been planted in such a way as to screen other buildings from view. They say house cannot be seen from the roads or the river. The line they use is that this is what God would've done if he'd had money. "JDR" even had a gorgeous golf course built on the site. Our docent, who grew up in the area, said she always thought she was glimpsing the "big" house when she was actually seeing the "playhouse." I had read that Rockefeller had purchased a portion of the Palisades for preservation - not realizing that part of the preservation was his view. Out in the lawn, which was littered with sculptures, were two large Etruscan vases. We were told they were thought to be the most valuable pieces in the estate - also about the most unimpressive looking!